Species of Concern data, derived March, 2016 for Landbird Conservation Plan. With nearly 450 breeding landbirds in the U.S. and Canada, and limited resources for conservation of terrestrial habitats, identifying the species most in need of conservation action is the key to efficient and effective bird conservation at multiple scales. Our primary tool for identifying the highest-concern species is the Partners in Flight (PIF) Species Assessment Process. 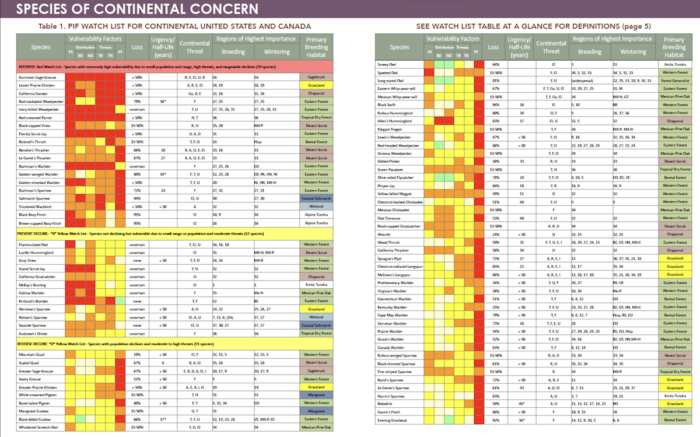 The PIF Watch List identifies 86 species—these are the species of highest conservation concern at the continental (range-wide) scale (Table 1). Some of these species are already recognized as federally threatened or endangered in the U.S. and Canada. The Watch List fosters proactive conservation that will help recover populations of the most at-risk species and keep the remaining species from becoming endangered. Brief definitions of the Watch List species categories can be found here. See the Landbird Conservation Plan for the full methodology. NOTE: Our growing Species Conservation Profiles section highlights Watch List species as well as Common Species in Steep Decline.